On January 6th Jazz Trumpet player 'Dizzy' (John Birks) Gillespie died in New Jersey, U.S.A. at the ripe old age of 75. He was born in South Carolina, the 9th child of a bricklayer, who also had his own band. When he was 16 he won a scholarship to study harmony and theory at the Laurinsburg Institute in North Carolina. Within two years he was playing professionally in Philadelphia. His early playing style was a deliberate imitation of Roy Eldridge, whom he was later to replace as trumpeter in Teddy Hill's orchestra. He earned his nick-name in the 30s for the joyful zanyness of his character and his clowning on stage, when playing in the big bands of Teddy Hill and Cab Calloway. Dizzy Gillespie was the last living 'great' from the bebop pioneers, a group of musicians who created a revolution in jazz in the early 40's. Others in the group were Charlie Parker, Bud Powell, Kenny Clarke, Thelonious Monk and Miles Davis. Dizzy and Charlie Parker in particular, when they were playing in the orchestras of Earl Himmes and Billy Eckstine, or jamming in New York jazz clubs, developed the basic principles of bebop. Dizzy once said that Charlie Parker was the 'other half of my heartbeat'. Dizzy's contribution - apart from the bright blistering-paced trumpet playing and his ever-present 'style' - came from his thorough grasp of musical theory, and from his stage dress! Because of the war and a strike in the record-making industry the results of these experiments were not widely known until 1946. First reactions were not promising. The whimsical melodies and complex nervous rhythms took some getting used to after the swings and riffs of classical jazz. In 1947 Dizzy established the first (and only) bebop big band, and in the 50s bebop won general acceptance. 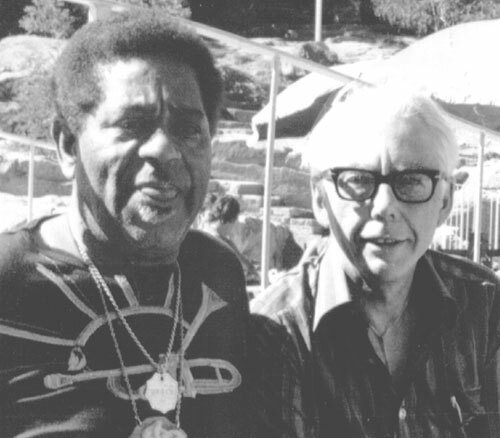 Dizzy also played an important part in the introduction of Latin-American rhythms in Jazz, working with Cuban musicians. Many of his compositions became jazz classics: A Night in Tunisia, Woody 'n You, Groovin' High, Salt Peanuts, Manteca, Things to Come, Con Alma and Dizzy's Dance. Dizzy was also known the world over for his bullfrog cheeks when playing in his crazy hats and with his bent trumpet (the result of an unfortunate fall), and his audience-friendly stage style. Between the virtuoso dancing phrases from his trumpet, he would intersperse sardonic jokes, silly announcements, and comic monologues. He once said that his cheeks had been studied by a scientist and had been given the name "Gillespie's pouches". So popular did he become that at election-time in America T-shirts appeared with his portrait and the words "Dizzy for President". He was a fierce opponent of racism: he once said that if he were ever elected he would rename the White House the Blues House and make jazz trumpeter Miles Davis, head of the CIA. He continued to perform until a few months before his death, and would talk about his Bahá´í beliefs in interviews. While on tour, he often received Bahá´í s backstage or attended Bahá´í events. He wrote a biography, 'To be or not to bop'. Excerpt from BAFA newsletter, March 1993, page 4. 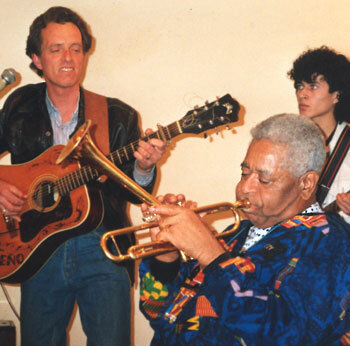 Chris Ruhe performing with Dizzy Gillespie in 1991 in Chile. ...I first met Dizzy in 1963 in England. I was attending the first Bahá´í World congress at Albert Hall in London, and was invited to attend a press conference in honour of Dizzy and other jazz musicians who would be part of a jazz festival. The press gathering was being held on a beautiful rolling estate just outside London. I arrived and signed the register "Lowell Johnson - jazz d.j. - South Africa", and was taken to one of about 20 umbrella-shaped tables on an expansive lawn. My guide explained that the musicians would visit the tables and we could talk with them as they came by. In the meantime we were supplied with drinks and snacks. One by one the musicians visited our table, but I was primarily interested in meeting Dizzy. Eventually my very diplomatic guide came to my table and asked, "Are you Lowell Johnson from South Africa?" 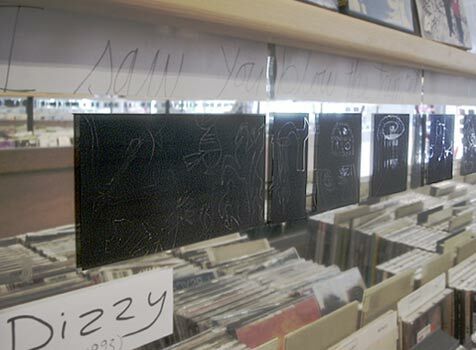 Dizzy a poem by June Perkins was part of the artwork, Conversations by Sonja van Kerkhoff, on show in a music shop in Leiden as part of the Close to the Wall Poetry festival, 2005. June Perkins' 57 line poem, also published in the book, Just Let the Wind was displayed along the whole wall of this shop for 2 months in the summer of 2005. The drawings by Sonja van Kerkhoff on transparent film on the mirrored walls, became more or less visible as you walked past. The images and broken images were intended to create their own voices or 'musics' in reaction to the words, sounds and rhythms in the poem, to jam along like one long score of music. I said yes, and the young man said: "I just came to warn you. Dizzy Gillespie is looking for you. He wants to punch you back to Johannesburg." I waited asking myself how I was going to handle this situation. I really did not want to punched by Dizzy Gillespie. ...Soon Dizzy came to our table. I let the other four at the table introduce themeselves first. Then as I had decided not to introduce myself immediately, I said a few things like: "I am very happy to meet you at last. It has always been my hope to get a chance to do an interview with you. My jazz fans will really appreciate it if I could ask you a few questions on tape. Oh yes, my name is Lowell Johnson from South Africa." When he heard my name and country, he clenched his fist and lifted his arm. He really wanted to punch me, but he kept his arm poised and aimed. "But, but... but you are American! ", he said. He had caught my accent. It was the first time in my life that I had ever been grateful to be an American. I hastily proceeded to take advantage of the hesitation. "Yes, I am an American. I have been a disc-jockey in South Africa since 1953. Most of my listeners are from Soweto and townships like Mamelodi, and they would be very happy to have a word of greetings from Dizzy Gillespie." He hesitated, relaxed his fist and shoulders, and after a struggle, he lowered his arm, but said, "No, not for South Africa." He returned and crossed to the tables on the other side of the lawn abandoning our table completely. ...In 1968 when Martin Luther King was assassinated Dizzy was deeply disturbed. The civil rights were important to him as were King's spiritual principles. Dizzy had already heard of the teachings of Bahá'u'lláh from a book a fan gave him but he had paid little attention. However with his friend Martin Luther King being killed so tragically Dizzy needed consolation. He began a Bahá´í in 1968 and recorded his reasons in his 1979 biography, "To Be, or Not ... to Bop". "...Becoming a Bahá´í changed my life in every way and gave me a new concept of relationship between man and his fellow-men and his family. I became more spiritually aware, and when you are more spiritually aware that will be reflected in what you do." Dizzy was never into drugs because he saw what they did to Charlie Parker and some of his other friends. Dizzy even gave up alcohol. When challenged he would just say: "It's a Bahá´í law. And it is good for me." And change the subject. Remembering the 1963 fiasco, I decided to try my luck at getting a personal interview with him again. So I rang his room from the hotel lobby and said: "My name is Lowell Johnson, a South African dee-jay and the secretary of the National Bahá´í Assembly of South Africa..."
"Sure, come on up." So I went to his room, knocked, and he greeted me with just a towel - he was just out of the shower. The very first thing he wanted to know was how the Bahá´í Faith was progressing, and how it was introduced into South Africa. I told him some humourous stories... of our times in Cape Town meeting Nyanga and Langa people behind the high walls and high hedges in order not to offend the neighbours; the need for caution and the wonder of Africans when they experienced equality at the table in a white home... Dizzy was not amused. Even in telling him of my times in Johannesburg in the early sixties, of how I had opportunity to explain the Bahá´í principles to the police. There was no smile and no comment from Dizzy. His position was clear. But we had a wonderful few days together and he asked me to chair his "soiree" at midnight for those who wanted to hear about the Bahá´í Faith. It was beautiful to see how he explained that the Bahá´í have no race prejudice. He kept repeating his favourite quotation: "The earth is but one country and mankind its citizens". ...After that I and other Bahá´ís tried to get him to South Africa, but Bill Sears told me, he always said: "It is not necessary; the Bahá´ís in South Africa are taking good care of that country." He meant, of course, promoting the oneness of humankind. Dizzy was a thorough professional. From Bahá´í friends I have learned that he often attended and visited Bahá´í homes all over the world. His world travels as humanity's jazz ambassador are legendary. My latest opportunity to see Dizzy was on November 26, 1992 at Carnegie Hall in New York. I was in New York for the second Bahá´í world congress and it was Dizzy's 75th birthday concert and his offering to the celebration of the centenary of the passing of Bahá'u'lláh. Dizzy was to appear there at Carnegie Hall for the 33rd time. The line-up read impressively like a who's who of jazz: Dizzy, John Faddis, "Doc" Holliday, James Moody, Paquito D'Rivera, and the Mike Longo Trio with Ben Brown on bass and Mickey Rocker on drums. There was one more Bahá´í who had a great influence on Dizzy. He met Enoch Olinga in Nairobi and they clicked instantly... Enoch gave Dizzy some African shirts and encouraged his search for his African roots. When Enoch was murdered in 1979 for no apparent reason, Dizzy felt bereft. He consoled himself by composing "Olinga". It became part of his repertoire and Milt Jackson recorded it with Mickey Roker, Dizzy's drummer. Dizzy had two funerals. One was a Bahá´í funeral at his request, at which his closest friends and colleagues attended. The second was at a Lutheran church in New York attended by the world. Excerpts from the BAFA newsletter, December 1993, page 7.